If I haven't made it clear before, I'm in an exclusive relationship. Every morning I wake up and look forward to seeing her patiently waiting for me. No matter if I'm feeling fully rested or have been up multiple times throughout the night, I know that I can count on her to bring a smile to my face with a delicious mug of freshly-brewed coffee in less than a minute. To be perfectly honest, however, I'll admit that my Keurig can be the tiniest bit... needy. Don't tell her I said this, but while I adore that all she needs is some water in her tank and a K-cup popped into the top, keeping her supply of K-cups well-stocked can sometimes get a little tiresome. Keeping track of what I have left, checking for sales at the store, getting the kids in the car to drive over and wait in line, etc. It all just manages to take away a little bit of that special affection that I feel for my Keurig, you know? Fortunately, I was recently introduced to the perfect way to reignite my love in the form of the convenience, information and rock bottom prices at Cross Country Cafe. A family-owned, nationally authorized distributor of Keurig K-cup coffees and brewers, Cross Country Cafe strives to deliver quality coffee (a huge selection!) at incredibly low prices. But this website doesn't just stop at offering regular and single serve gourmet coffee, their pursuit for innovation and customer service has led them to become nationally acclaimed for their integrity, responsibility, loyalty, legitimacy, dependability and more. Let's face it. If you love coffee, why not turn to experts that strive to prove that a better buying experience does indeed exist? immediately struck by the vast array of options available. Just in K-cups, I could pick from well-known brands such as Green Mountain, Donut House, Gloria Jeans, Caribou, Tully's, Emeril's, Wolfgang Puck and more. Whether you prefer light, medium or dark roast; extra bold, flavored or decaffeinated coffee; or are shopping for teas, seasonal offerings or K-cup storage and accessories, you'll find it all right here in one place. Add in the free shipping with your purchase of five or more boxes of K-cups and Cross Country Cafe's super-fast delivery, and you hardly have time to say, "Pass the creamer," before your boxes of deliciousness have arrived. While I couldn't have been any more excited about my selection of K-cups from Cross Country Cafe and just how fast they arrived, I also realized that their prices truly were second to none. I have typically found K-cups priced, on average, around $13 in stores near me... for a box containing approximately 16 K-cups. In contrast, each of these boxes from Cross Country Cafe are also around $13, but for 24 K-cups! That's eight whole days of extra coffee that I can be enjoying for the same price! And if the everyday low pricing isn't enough incentive to head over, Cross Country Cafe also hosts their weekly Wacky Wednesday Sale where customers can snap up a great deal on K-cups, gourmet coffee pods, ground and whole bean coffee and more. If you are looking for a way to take advantage of great coffee and great offers, you're going to want to head over to CrossCountryCafe.com to start saving money on your favorite coffees, teas and more. Or, if you're looking for a great gift for the coffee-lover in your life, a Cross Country Cafe gift card (which can be purchased in any amount between $5 and $400) would make a wonderful surprise! Find out much more about Cross Country Cafe online as well as connecting with them on Facebook and Twitter so that you'll never miss out on the gourmet coffee joys that they can provide (while saving you money)! 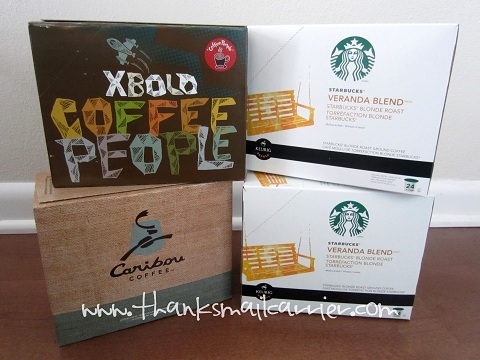 One lucky person will win their choice of FOUR boxes (96 K-cups!) from Cross Country Cafe! A big thank you to Cross Country Cafe for providing four boxes of K-cups for me as well as for one lucky giveaway winner. The opinions shared are my own and honest and if you really need to see more, click here to see how I roll. I love Green Mountain Caramel Vanilla Cream! Donut House Collection... any of the 3! I would choose the Gloria Jean's Hazelnut K-Cups. either the Starbucks or the Donut House collection. I would like to try Gloria Jean's French Vanilla Supreme kcups. I would defineately get Emeril's Big Easy Bold! Yummy! I'd select CHOCOLATE GLAZED DONUT as my first choice since it sounds amazing and I haven't tried it yet! I would choose the Green Mountain Caramel Vanilla Cream. Sounds yummy! The Donut House Chocolate Glazed Donut b/c it's one of the best ones I've tried since I got my Keurig in December. I would love Green Mtn Coffee Island Coconut. Its the best! CARIBOU BLEND KEURIG KCUPS would be one of them. I'd choose the Green Mountain Wild Mountain Blueberry!! I think I would want to try the TULLY'S FRENCH ROAST EXTRA BOLD KEURIG KCUPS. I really enjoy an extra bold flavor!! Thansk for the giveaway!! I would choose the CELESTIAL SEASONINGS® INDIA SPICE CHAI TEA KEURIG KCUPS. I'd like the Green Mountain Breakfast Blend. I definitely would get some of the FAIR TRADE VERMONT COUNTRY BLEND. Green Mountain Coffee Island Coconut - great summertime flavor! I would like to try the Wolfgang Puck Breakfast in Bed Keurig K-cup. Thanks. We love the Donut House Chocolate Glazed donut! I would love to try the donut shop! I would get Fair Trade Golden French Toast Keurig Kcups. I love it! Thanks for the chance to win! the green mountain Fair Trade Wild Mountain Blueberry...yum! I just started drinking coffe but the caramel vanilla cream k-cup sounds delicious. I would choose the Donut House blend for sure!! The Gloria Jeans Mudslide Keurig Kcups sounds delicious! I always drink Breakfast Blend. I would like Green Mountain Half-Caff!! I would want the Green Mountain's Caramel Vanilla Cream k-cups. Thanks for the chance! Caribou!! any variety except Decaf! I KNOW I would pick the Green Mountain Nantucket Blend...its one of my all time favorites! green mt. dark magic. my fav. I would love to try anything from Starbucks. Or Donut shop classics I have never tried. I like the Chai tea... in fact, I'm having some right now! I would like to try the Gloria Jean French Vanilla Supreme K-cups. I'm addicted to the Tully's French Roast and Hawaiian Blend. I'd get Tully's French blend. Excellent! My favorite K cup is Donut House Chocolate Glazed Donut, but I'd also love to try the GMC Caramel Vanilla Cream and the Butter Toffee from Gloria Jean. I would buy the Green Mountain Caramel Vanilla Cream. The Donut House Cinnamon Roll flavor sounds good. I've never seen that one before! Green Mountain Caramel Vanilla Cream. Thanks so much for the fantastic giveaway! I would choose Tully's Breakfast Blend. It's one of my favorites. I would like to try the Island Coconut Keurig Kcups. I'd like the french roast. Thanks! DONUT HOUSE COLLECTION CINNAMON ROLL KCUPS I would get this yummy!! Gloria Jean's French Vanilla Supreme! Please! Yikes...it's so hard to choose!!! I guess the Green Mountain Caramel Vanilla Cream. 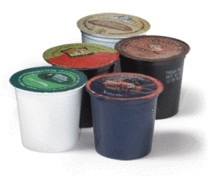 I always have a hard time choosing when I have so many choices of K-cups. One box I would choose is Celestial Seasonings Tea variety sampler. I would definitely get some chocolate glazed donut k-cups. I am new to the Keurig K-cups and have not yet tried most of the flavors I want to try! There are so many and they all look so yummy! But if I had to pick a flavor, it would be the Caramel Vanilla Cream. It just sounds so good! I'd like the etra bold flavors, especially black tiger. Definately the donut house collection. I would select ISLAND COCONUT! Yummm! the Colombian fair trade select would be one! I'd like to try the earl grey tea. Caribou Blend is a favorite in our house, and Cross Country Cafe carries it! Wolfgang Puck Jamaica Me Crazy. I might pick Island Coconut - it sounds interesting! The Green Mountain CARAMEL VANILLA CREAM sounds yummy!! The Celestial Seasonings English Breakfast Tea Keurig Kcups! Caramel Vanilla Cream is my fave. I would love to try the Gloria Jean's French Vanilla Supreme. I'd like the Gloria Jean's Hazelnut K-Cups. I would love the Gloria Jean's Hazelnut K-Cups. I'd love the chai tea! I would choose the chocolate glazed donut k-cups. Thanks for the chance. I love the toffee coffee, I also may choose some donut house....just not sure. I love so many! I would choose the Green Mountain Breakfast Blend. I love Caribou Blend and Emeril's! chocolate glazed coffee k-cups sounds yummy! I want to try the Caramel Vanilla Cream k cups. I'd like to try the Donut House Cinnamon Roll Variety. I'd love to get the Donut Shop Extra Bold k-cups! Would definitely select the Donut House Collection cinnamon roll cups! sounds sooo delicious! I would love to get Starbucks! I might choose the DONUT HOUSE COLLECTION CINNAMON ROLL KCUPS if I win. I like the Caribou K-Cup Variety Pack. I would get the Green Mountain Breakfast Blend cups! would have to buy the machine. green mountain breakfast sounds good. I would probably choose the CELESTIAL SEASONINGS TEA VARIETY SAMPLER. I'd get the Gloria Jean's French Vanilla Supreme Keurig Kcups. I'd pick Gloria Jean's Mudslide k cups. dark magic!! I love those ones! extra bold all the way! I would like to try the Donut House Collection Cinnamon Roll Kcups. I Love them - but I think the Classic Kona blend is my fav! I'd like to try the Donut House collection. Tully's Hawaiian is excellent - great extra bold dark roast. Green Mountain Breakfast Blend! Love a light roast. Green Mountain Caramel Vanilla Cream. One of my favies! I would get the Colombian Fair Trade Select. I would first try the Green Mountain Hazelnut K-cups and then the French Vanilla. I love flavored coffees. I would try CARAMEL VANILLA CREAM or any tea. I would choose the Green Mountain Caramel Vanilla Cream or Pumpkin Spice. Yum! Green Mountain Caramel Vanilla Cream.